They say when you're a teacher, your life is changed forever. It's totally true, but not always in the ways you'd think. Here are 7 ways teaching has ruined me. 1. I can't sleep in past 8am. The worst part is I actually feel proud of myself for sleeping in all the way until the eight o'clock hour. It's like, "yes! 8am! Livin' the high life!" 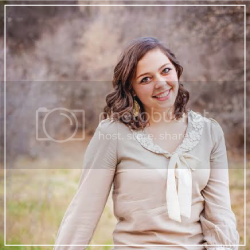 What happened to the high school me who could sleep 'till 11 on Saturdays? 2. I can't meet a great kid without plotting ways to get them in my 5th grade class. Hey, a teacher can dream. In a perfect world, our classes would be full of that cute second grader who says hi when you're on bus duty and that one darling, responsible little cousin you talk to at family reunions. 3. I can't sit through a meeting without critiquing the presenter. I have a bad case of this one. The lessons at my church are always great, but I find myself thinking how good it would be to add a discussion here, ask a question there, write the references on the board, etc. 4. I can't go on a vacation without collecting things for my classroom. You should have seen our Moab trip. "Pull over, that's an igneous rock!" "Where's the camera, quick before we pass this plateau!" and shoving as many informational brochures as fit in my purse at the visitors center. 5. I can't decorate my house without the urge to use bulletin boards and construction paper. What do you mean, you don't sell owl-themed green welcome signs at Pottery Barn? 6. I can't help giving the "teacher look" to my family sometimes. I swear it's accidental. And if you complain about it, I'll give you the teacher look until you stop complaining :) If you're lucky it might even come with a slight shaking of the head. Rare cases warrant a finger point and an eyebrow raise. 7. I can't see a grammar mistake on Facebook without resisting the urge to have them re-write the sentence three times correctly. "Watch this video and YOUR life will change forever"
Oh, teaching. Still the best profession times infinity, early mornings and all. Teachers, what am I missing? Ha! I love this! 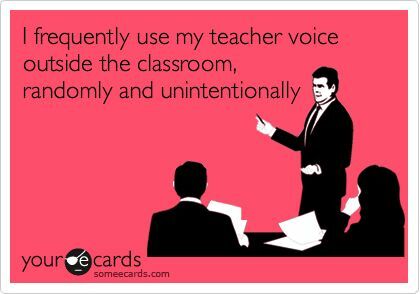 I totally use my teacher voice at inappropriate times and recruit kids to be in my class! 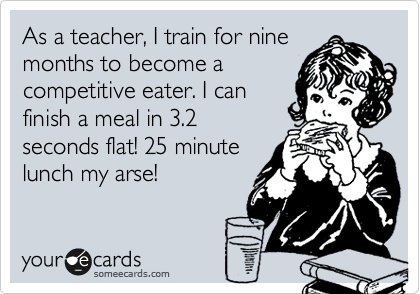 Your teaching posts make me miss the classroom. I student taught in a 4th/5th multi-age classroom, with two teachers who were always in charge of bus duty. I am forever using my teacher voice on my family. We have multiple family members about the same age as my students, so I tend to pull it out when they are acting up at family gatherings. It's amazing how it just comes out around any and all children!